This entry was posted in Award-winning columns The Rockland Jewish Reporter and tagged AJPA comic books comics Jews Marla Cohen Rockower Award super heroes Superman on November 24, 2006 by Marla Cohen. The docent’s question lingered in the exhibition room. Her charges, a group of high school kids visiting the Jewish Museum in Manhattan did what kids do when put on the spot. They looked at the ceiling, at their shoes, but not at the docent. 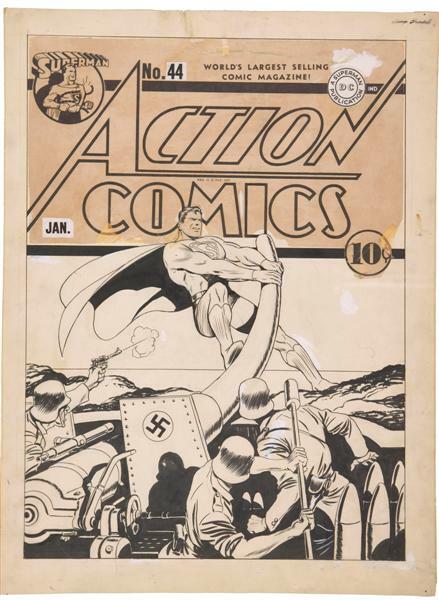 The exhibit was on comic books, more specifically, “Superheroes: Good and Evil in American Comics,” an exhibit of more than 70 works dating from the late 1930s through the late ’50s, the heyday of the comic book. Surely a bunch of teens could find something to say about comic book heroes. “Right,” she replied. But I thought her response and the answer stopped short. This is an exhibit of superhero artwork, paired with a larger exhibit of comic book art in an adjacent room. 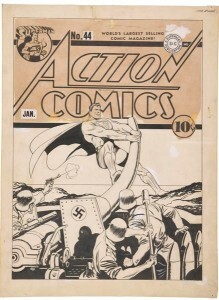 The works on display in both rooms focus on the Jewish artists of the genre and in the superhero show, on the creators of the likes of Superman, Batman, the Green Lantern, Captain American and the Avenger, to name the better known. If anyone needed a superhero to right the world’s injustices in the late ’30s and early ’40s, when most of the superheroes we’re familiar with were “born,” it was the Jews. And who would know that better than the artists who created these fighters for truth, justice and the American way? Most of the artists whose work was on display had been born into immigrant families, only a generation removed from Europe’s pogroms. Not wishing to fall prey to an overstatement of Jewish influence, it’s amazing nonetheless that, as a group these guys, gave us the characters that became American icons. Much has been said of the superheroes’ “biographies” and the parallels to the immigrant experience. The superhero is always an outsider, with alter egos that fits into mainstream society. There are parallels to our own folklore. What is a golem, but a handcrafted savior of the Jewish people? And if you scratch a little deeper, the Jewish Museum is happy to point out parallels to the Torah. The museum notes that Superman — created by Jerry Siegel and Joe Schuster, sons of immigrants born in Cleveland — bears a passing resemblance to Moses. Superman, whose given name on Krypton is Kal-El (all that is God), is sent to Earth in a small, solitary vessel — a spaceship — and is adopted, not unlike the baby Moses who in his basket is rescued by Pharaoh’s daughter. When the days grow colder and the light decreases, the heroes that spring most readily to mind are the ones who defied Hellenization — or as we’d call it today, “assimilation” — and went on to lead a rebellion against the Syrian Greeks ruled by Antiochus. In the year 164 B.C.E., after three years of battle, the Jews succeeded in overthrowing their oppressor and cleansed the holy Temple. Any child weaned on the eight nights of Chanukah lights knows the basics of the story and can tell you that the miracle of the oil is supplanted by the miracle of the victory. That a tiny army, led by the Hasmonean family of Mattathias and his son Judah could defeat a much mightier army is the real miracle. And so the Maccabees — who struck like hammers — became a type of superhero. They represent all good, all the time. They fought for our rights, so that we could be Jews, and we will ignore the pesky details of how many Hellenizing Jews they did away in their battle. “I want to be a Maccabee soldier, brave and bold,” the refrain from a song learned in nursery school, is what stays with us. Maccabees, like the superheroes on display at the Jewish Museum, which continues through Jan. 28, fight against injustice, know where they stand against tyranny, and aren’t afraid of taking the unpopular position. Their alter ego is that of priests, but we remember them today primarily as victorious warriors. The world has often viewed Jews as a pariah, vilifying and persecuting us throughout history. It doesn’t seem surprising to me that the creators of the original superhero comics were men whose families had fled Europe. Nor does it come as a surprise that Superman went to battle in the pages of Marvel comics against Hitler and Mussolini a full year before the United States entered World War II. Today, most Jews in this country lead lives of abundance and comfort. We must be accepted here, or certainly we couldn’t be marrying non-Jews at the high rates that we do. Jewish culture, if not Judaism itself, is mainstream, part of the pop cultural landscape. For young Jews, Borat is ironic and hilarious, while their parents may feel that he’s simply offensive. Whether Cohen is making a point or just being provocative is open to debate. But the end result of his “interviews” isn’t. It’s not news that anti-Semitism still abounds. But we American Jews take our acceptance in society for granted, much like the Hellenizers of Judah Maccabee’s day did. Most of us expect to and do live a pretty good life. But the lessons of history, from the very real Maccabees to the very fictional Superman battling the Axis powers, say we shouldn’t. Of course Maccabees are real and Superman is not, any kid can tell you that. But it’s what Borat reveals that makes you pause and think.